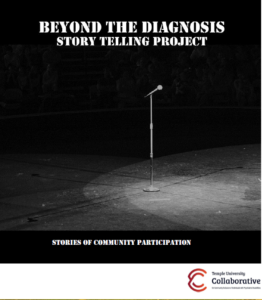 Focuses on the dual challenges to community inclusion success: the responsibilities of providers to work with both service recipients and mainstream community groups. They are tasked with promoting community inclusion for individuals and organizations in the mainstream of community life, with an emphasis on the role of mental health providers in both traditional and peer-run program environmentsin partnering with mainstream community groups. 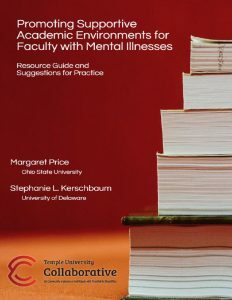 Promoting Supportive Academic Environments for Faculty with Mental Illnesses: Resource Guide and Suggestions for Practice provides both a review of current research into the experiences of academic faculty with mental illnesses and a set of recommendations for academic administrators and colleagues to promote a more welcoming work environment in higher education. This guide focuses on ways to make college and university campuses more accessible for faculty with mental disabilities. It provides concrete suggestions for creating a “culture of access” by offering effective strategies for promoting inclusive language, managing accommodations, and revising policies around recruitment, hiring, and leaves of absence. The recommendations in this guide are informed by a survey that gathered information from more than 300 self-identified faculty with mental-health histories. Completed by Margaret Price (The Ohio State University), Stephanie L. Kerschbaum (University of Delaware), Mark Salzer (Temple University) and Amber O’Shea (Temple University), this survey is the first of its kind and joins other key research projects sponsored by the Temple University Collaborative. The guide, authored by Price and Kerschbaum, can serve as a training manual on its own, or can be used as a basis for interactive workshops. This document focuses on strategies for creating more welcoming work environments within mental health agencies for staff members with mental health conditions. 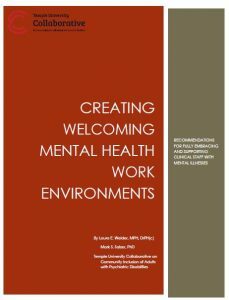 It provides readers – those who have been diagnosed with a mental health issue as well as agency CEOs, board members, supervisors, managers, and anyone else that might derive benefit from our suggestions with a set of ideas and strategies that can be implemented to better support agency colleagues by creating and maintaining a positive, supportive, and welcoming work environment that enhances work life for all employees. 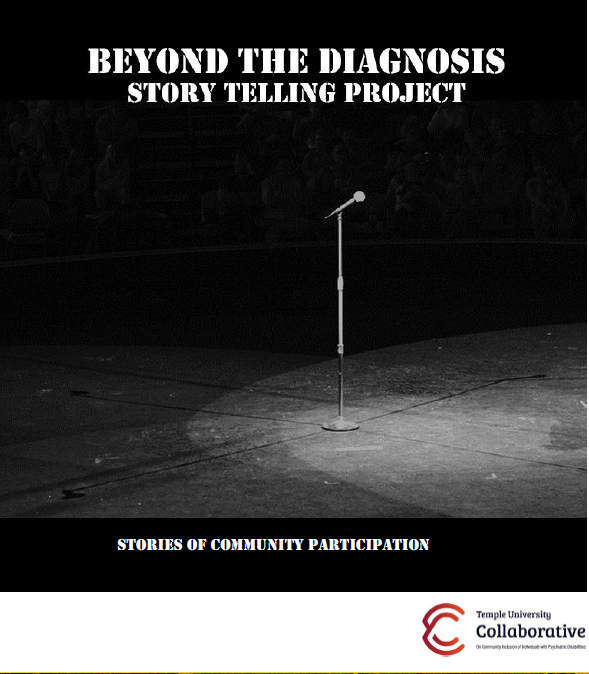 This manual is designed to encourage the sharing of real stories of community participation. Inside, we include suggestions for organizing storytelling events and activities to help people develop stories based on their experiences. This manual can be used by consumers who want to develop their own stories. Or, it can be used by providers who want to assist consumers in their efforts to identify and describe the people, places, and things that are meaningful in their communities.